"I know that I'm a mess. I'm complicated, frustrating, confusing, and sometimes I'm crazy and needy. I know I'm not always the best at saying the right things and I do a lot of things wrong. 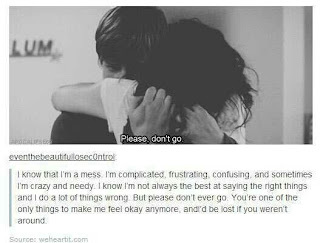 But please don't ever go. You're one of the only things to make me feel okay anymore, and I'd be lost If you weren't around." Now, I lost my baby because of my own mess. I'm sorry.